Bogs CLASSIC BUTTERFLIES-W - Non-marking and self-cleaning outsole. Add some color and fun to those cold, wet days on the farm with the classic butterflies. Constructed with 7mm Neo-Tech insulatio. 100 percent waterproof, comfort rated to 40°f/-40°c, and non-marking, self-cleaning outsole for superior traction make this boot your perfect work companion 100% waterproof. Comfort rated to -40˚F/-40˚C. Durable hand lasted rubber with a four way stretch inner bootie. Bogs 72261-009-6 - Constructed with durable hand-lasted rubber. Fun and stylish colors up the ante so that you can look as good as your feet feel. 7mm waterproof neo-tech™ insulation. Lined with bogs Ma x-Wick to keep feet dry. The bogs® classic high handles is the perfect boot to handle anything your day may bring. Durafresh organic bio-technolog y activates to fight odors. Easy-on pull handles. Constructed with 7mm Neo-T ech insulation. Durable hand lasted rubber with a four way stretch inner bootie. Contoured eco EV A footbed. Comfort-rated from temperate to -40°f. Bogs 71563-492-10 - Your kid can splash through puddles and stay dry while doing it in a pair of Bogs boots These rugged winter boots are made to keep your little one warm and dry with its waterproof upper and warmth rating of -30'º F. Lined with bogs Ma x-Wick to keep feet dry. Contoured eco EV A footbed. Durafresh organic bio-technolog y activates to fight odors. Comfort rated to -30 Degrees F/-34 Degrees C. Available in toddler 1-4 years, little kid 4-8 years and big Kid 8-12 Years sizes. Constructed with 7mm Neo-T ech insulation. Equip your child with the gear necessary for epic puddle jumping by getting them a pair of rain boots by Bogs Durable hand lasted rubber with a four way stretch inner bootie. Bogs Kids Classic High Waterproof Insulated Rubber Rain and Winter Snow Boot for Boys, Girls and Toddlers, Multiple Color Options - . Contoured footbed with earth-friendly bio-technology helps fight unwanted odors. Sturdy handles makes these winter boots easy for little kids to get on and off. Its performance outsoles provide the traction your child needs to play in the rain. Waterproof and light weight rain boot is made with a durable rubber over a four-way stretch inner bottie for dry feet. Made with 7mm neo-tech insulation to keep feet warm and comfortable in cold weather. Boot height 9-inches, circumference at top 9-Inches based on size 10 Toddler. Bogs 71141-300-10 - The non-slip outsole on this women's boot will keep you steady when the going gets tough. Contoured eco EV A footbed. Weather is no match for the bogs Classic HIgh Handles rain boots, which are comfort rated to sub-zero conditions and 100% waterproof. Sturdy handles makes these winter boots easy for little kids to get on and off. Non-slip rubber outsole with traction lugs. Handles atop the shaft make these durable boots easy to slip on. Durafresh organic bio-technolog y activates to fight odors. Pull-on handles. Aegis antimicrobial odor protection insole. Made with 7mm neo-tech insulation to keep feet warm and comfortable in cold weather. Bogs Womens Classic High Handle Waterproof Insulated Rain and Winter Snow Boot - Mother nature has met her match in these innovative Bogs Classic High Handles rain boot. Waterproof and light weight rain boot is made with a durable rubber over a four-way stretch inner bottie for dry feet. Contoured footbed with earth-friendly bio-technology helps fight unwanted odors. Comfort rated to -30 Degrees F/-34 Degrees C.
Tall rain boot featuring rubber upper with stretch-fabric shaft and moisture-wicking sock-liner. Lined with bogs Ma x-Wick to keep feet dry. Be unafraid to face the storm in the Bogs Classic High Handles. Bogs 72155-009 - Comfort rated to -30 Degrees F/-34 Degrees C. Constructed with 7mm Neo-T ech insulation. Durafresh organic bio-technolog y activates to fight odors. Waterproof and light weight rain boot is made with a durable rubber over a four-way stretch inner bottie for dry feet. Durable hand lasted rubber with a four way stretch inner bootie. Contoured eco EV A footbed. Made with 7mm neo-tech insulation to keep feet warm and comfortable in cold weather. Lightweight puddle jumper for spring. Contoured footbed with earth-friendly bio-technology helps fight unwanted odors. Available in toddler 1-4 years, little kid 4-8 years and big Kid 8-12 Years sizes. 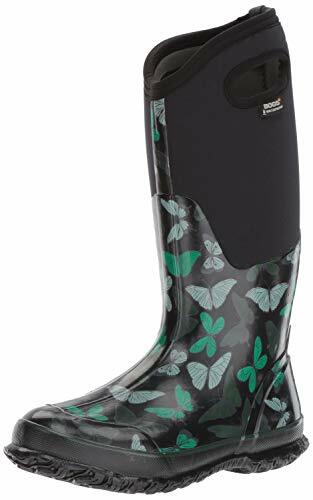 Bogs Kids' Classic High Waterproof Insulated Rubber Neoprene Rain Boot Snow - Durable hand lasted rubber with a four way stretch inner bootie. Comfort rated to -30 F. Sturdy handles makes these winter boots easy for little kids to get on and off. Pull-on handles. Aegis antimicrobial odor protection insole. Tall rain boot featuring rubber upper with stretch-fabric shaft and moisture-wicking sock-liner. Bogs 51377 - Waterproof and light weight rain boot is made with a durable rubber over a four-way stretch inner bottie for dry feet. Lined with bogs Max-Wick to keep feet dry. Non-slip rubber outsole with traction lugs. Available in toddler 1-4 years, little kid 4-8 years and big Kid 8-12 Years sizes. Made with 7mm neo-tech insulation to keep feet warm and comfortable in cold weather. Durable hand lasted rubber with a four way stretch inner bootie. Tall rain boot featuring rubber upper with stretch-fabric shaft and moisture-wicking sock-liner. Stretchy shaft with twin pull-on handles. 100% waterproof rain and snow boot. Durafresh organic bio-technolog y activates to fight odors. With a non-slip rubber outsole, and a four-way stretch inner bootie for even greater comfort, anti-microbial insoles to prevent odor, you can move confidently in the Ultra High. Bogs Men's Classic Ultra High Insulated Waterproof Winter Boots - 100% waterproof. Constructed with 7mm Neo-T ech insulation. Contoured footbed with earth-friendly bio-technology helps fight unwanted odors. Comfort rated to -30˚F/-34˚C. 7mm waterproof Neo-Tech insulation. Bogs Classic High Winterberry-W - Comfort rated to -30 F. Lined with bogs Ma x-Wick to keep feet dry. Durafresh organic bio-technolog y activates to fight odors. Height is 15 inch. Internal midsole with rubber sponge delivers extra cushion and warmth. Comfort rated to -30 Degrees F/-34 Degrees C. Durafresh bio-technology activates to fight unwanted odorsDual-density contoured EVA footbed. Pull-on handles. Aegis antimicrobial odor protection insole. Stretchy shaft with twin pull-on handles. Circumference at calf is 17 inch. Winter/rain boot with waterproof shell bottom featuring a neoprene shaft with pull-on handles. Boot height 9-inches, circumference at top 9-Inches based on size 10 Toddler. Contoured eco EV A footbed. Bogs Women's Classic High Winterberry-W - Durable hand lasted rubber with a four way stretch inner bootie. Lined with bogs Max-Wick to keep feet dry. 7mm waterproof Neo-Tech insulation. Lightweight puddle jumper for spring. Tall rain boot featuring rubber upper with stretch-fabric shaft and moisture-wicking sock-liner. Constructed with 7mm waterproof Neo-Tech insulation to keep your feet comfortable to -40F. Bogs CLASSIC PANSIES-W - Comfort rated to -30 F. Constructed with 7mm Neo-T ech insulation. Boot height 9-inches, circumference at top 9-Inches based on size 10 Toddler. 100% waterproof rain and snow boot. Contoured eco EV A footbed. Comfort rated to -30˚F/-34˚C. Lined with bogs Ma x-Wick to keep feet dry. Durable hand-lasted rubber over a four-way stretch inner bootie. Lined with bogs Max-Wick to keep feet dry. Circumference at calf is 17 inch. Winter/rain boot with waterproof shell bottom featuring a neoprene shaft with pull-on handles. Contoured eva foot bed with DuraFresh that ﬁghts odors. Tall rain boot featuring rubber upper with stretch-fabric shaft and moisture-wicking sock-liner. Bogs Women's Classic Pansies Snow Boot - Height is 15 inch. Internal midsole with rubber sponge delivers extra cushion and warmth. Lightweight puddle jumper for spring. Constructed with 7mm waterproof Neo-Tech insulation to keep your feet comfortable to -40F. Comfort rated to -30 Degrees F/-34 Degrees C. Contoured footbed with earth-friendly bio-technology helps fight unwanted odors. Sturdy handles makes these winter boots easy for little kids to get on and off. Bogs Classic Ultra Mid-M - Height is 15 inch. Internal midsole with rubber sponge delivers extra cushion and warmth. Contoured footbed with earth-friendly bio-technology helps fight unwanted odors. Stretchy shaft with twin pull-on handles. Dual-textured rain boot featuring asymmetric opening and dual pull handles. Comfort rated to -30˚F/-34˚C. Durable hand lasted rubber with a four way stretch inner bootie. Lined with bogs Ma x-Wick to keep feet dry. Lined with bogs Max-Wick to keep feet dry. Lightweight puddle jumper for spring. Tall rain boot featuring rubber upper with stretch-fabric shaft and moisture-wicking sock-liner. Winter/rain boot with waterproof shell bottom featuring a neoprene shaft with pull-on handles. Bogs Men's Classic Ultra Mid Insulated Waterproof Winter Snow Boot - 100% waterproof rain and snow boot. Durafresh organic bio-technolog y activates to fight odors. Durable hand-lasted rubber over a four-way stretch inner bootie. Sturdy handles makes these winter boots easy for little kids to get on and off. Durable hand-lasted rubber over a four-way stretch inner bootie. Made with 7mm neo-tech insulation to keep feet warm and comfortable in cold weather. Bogs Classic High-M - Contoured eva foot bed with DuraFresh that ﬁghts odors. Winter/rain boot with waterproof shell bottom featuring a neoprene shaft with pull-on handles. Contoured eco EV A footbed. Boot height 9-inches, circumference at top 9-Inches based on size 10 Toddler. Lightweight puddle jumper for spring. Non-slip rubber outsole with traction lugs. Contoured footbed with earth-friendly bio-technology helps fight unwanted odors. Comfort rated to -40˚F/-40˚C. Constructed with 7mm Neo-Tech insulation. 100% waterproof. Durable hand lasted rubber with a four way stretch inner bootie. Lined with bogs Max-Wick to keep feet dry. Durafresh organic bio-technolog y activates to fight odors. Bogs Mens Classic High No Handle Waterproof Insulated Rain and Winter Snow Boot - Height is 15 inch. Internal midsole with rubber sponge delivers extra cushion and warmth. Durable hand-lasted rubber over a four-way stretch inner bootie. Stretchy shaft with twin pull-on handles. Comfort rated to -30˚F/-34˚C. Waterproof. Bogs Kids - Dual-textured rain boot featuring asymmetric opening and dual pull handles. Lined with bogs Ma x-Wick to keep feet dry. 100% waterproof rain and snow boot. Shaft circumference is 16 inches. Lined with bogs Max-Wick to keep feet dry. Durable hand lasted rubber with a four way stretch inner bootie. 100% waterproof. Durafresh organic bio-technolog y activates to fight odors. Circumference at calf is 17 inch. Winter/rain boot with waterproof shell bottom featuring a neoprene shaft with pull-on handles. Durable hand lasted rubber with a four way stretch inner bootie. Comfort rated to -40 F/ -40 C. Tall rain boot featuring rubber upper with stretch-fabric shaft and moisture-wicking sock-liner. Bogs Youth Classic Geo Boot - Lined with bogs max-wick which moves sweat away from your foot to keep you dry. Constructed with 7mm neo-tech waterproof Insulation. Note: the sizing info on the box will differ slightly from our sizing Ex: Bogs 7I = 7 Toddler, Bogs 1K = 1 Little Kid. Available in toddler 1-4 years, little kid 4-8 years and big Kid 8-12 Years sizes. Sturdy handles makes these winter boots easy for little kids to get on and off. 100% waterproof rain and snow boot.